How many times have you seen this kind of statement in the last few years? : "The official unemployment rate cited by the government is 7.8% but the REAL unemployment rate is 14.4% if you include the underemployed." Of course the underemployed and marginally attached workers are out there when the economy is good too. When unemployment was 5% were people running around making sure we were all aware that the 'REAL' rate was 9.2%? Not that I recall. As you can see in the chart the broader U-6 unemployment measure plus the marginally attached and underemployed workers is generally a few points higher than the simple unemployment measure. The numbers are roughly proportional as well. 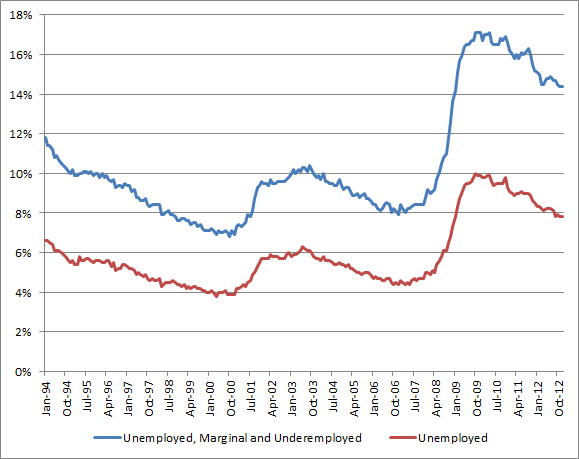 The marginal and underemployed number is around 60-80% of the unemployment number.